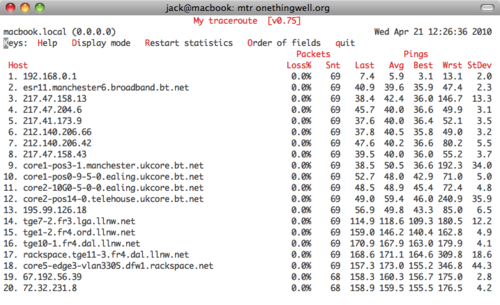 I came across an excellent alternative to the command line ‘ping’ and ‘traceroute’ tools recently. It’s a utility called mtr, which combines the statistics and prints their functionality into a single network diagnostic tool, reporting details on the network connection between your host machine and whatever the destination host is, determining the address of each network hop (like traceroute), and sending ICMP ECHO requests along the way (like ping) to determine the response quality of each network link. To install and use mtr you will either need DarwinPorts or to be a familiar with the command line and compiling from source on your Mac, both of which requires the installation of Xcode. You can download the source of MTR at the developers home or the more user friendly installation through DarwinPorts. I found mtr while reading old posts on OneThingWell, and the screenshot is borrowed from them as well.
! quite beneficial put up! I am going to increase a link to this article on my web site.